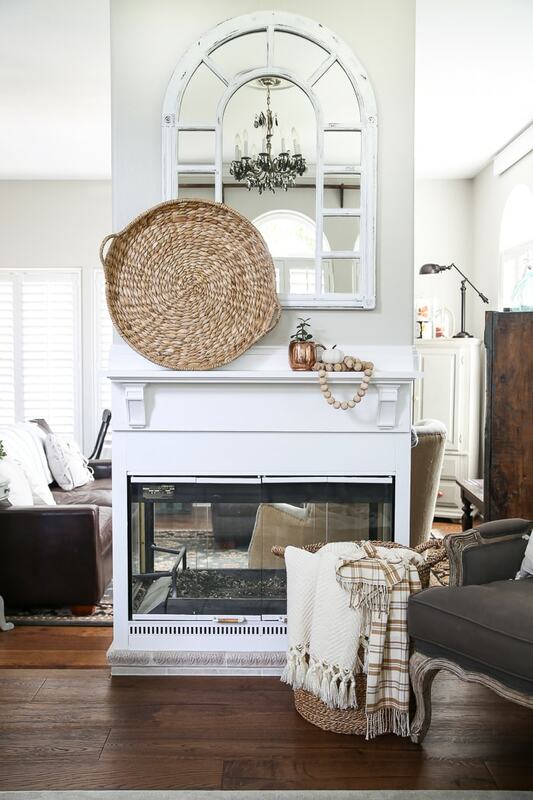 Looking for fireplace makeover ideas? 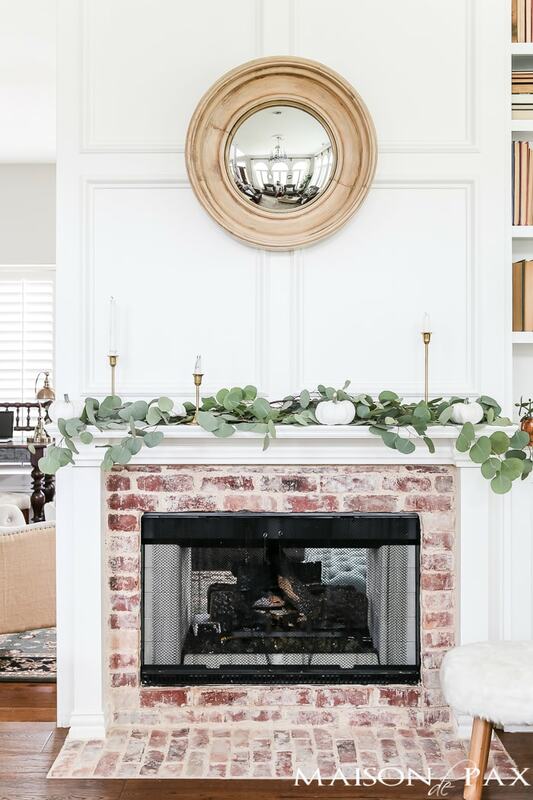 See how this awkward glass fireplace was transformed into an elegant classic with antique brick, white molding, and a gas insert. 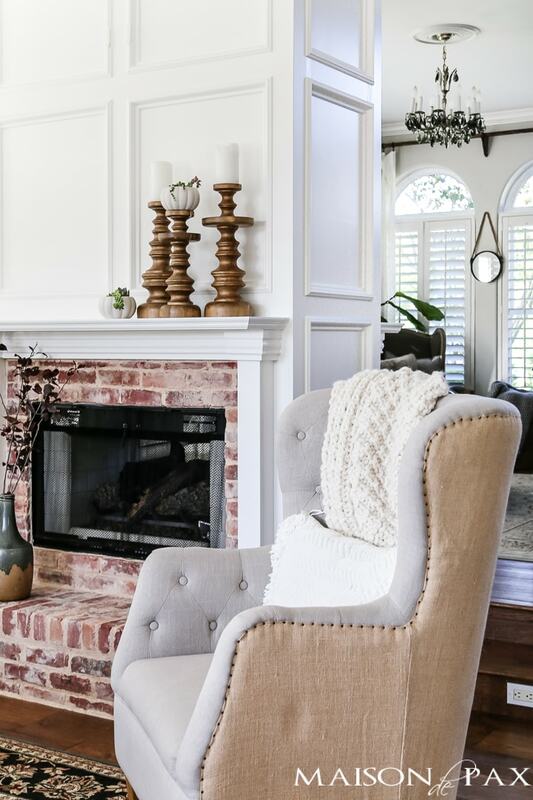 We actually completed this fireplace makeover a little over a year ago, but I regularly get questions regarding it, so I thought it might help if I put all the answers in one place. Plus, sometimes when something is right in front of you it can be hard to see the growth and changes. It takes a stepping back, if you will, to see just how far you’ve come… And I feel that is true about our living room. The only two things we did in the house before we moved in were to replace the floors and paint then entire downstairs in SW Agreeable Gray. The fireplace was a rather awkward little glass box that only semi-separated the two living spaces (and the gas insert didn’t work), but we wanted to take our time deciding on how to change it. 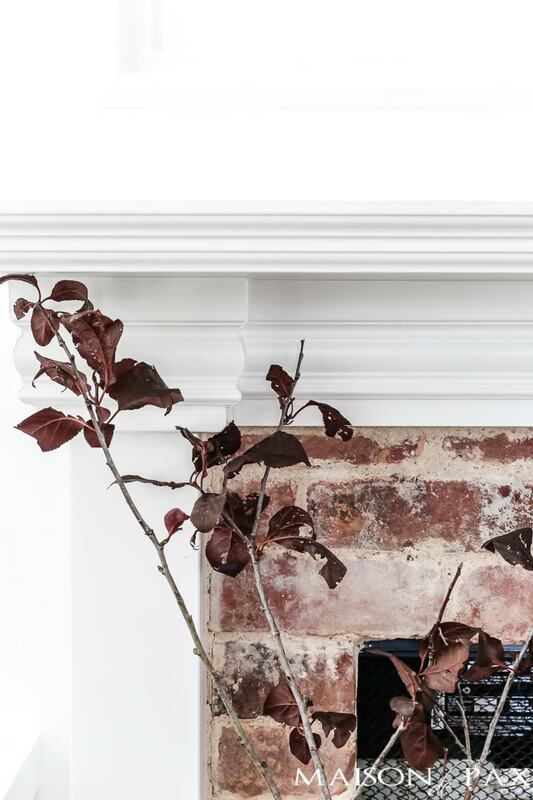 We started with this DIY mantel and a little cosmetic fireplace makeover to help the space feel more like our style. While it might sound nice to have the two rooms open to one another, the step down unfortunately made it difficult to use the spaces simultaneously, which led to them just feeling like they conflicted with one another. Plus, with so many windows (which I love! not complaining!! ), furniture placement was really difficult. So after a year or so, we decided it was time to actually make some more significant changes. We wanted the downstairs to still feel open while effectively separating the two spaces and providing some much-needed storage and wall space. So we enclosed one side of the fireplace with a double sided bookcase (see both sides below) and built a new (slightly wider) chase with a new fireplace with a gas insert. We installed this two-sided fireplace and then dressed it up with a brick overlay. We used this brick (it’s not actually antique, but it definitely has that look) and had our tile guy cut the full-sized bricks into veneer-like tiles. The full sized bricks were used for the raised hearth on the lower level while the tiles were used to cover the metal face of the fireplace and the flat hearth. I asked that they all be installed with a rather messy white mortar to accentuate that aged feel. 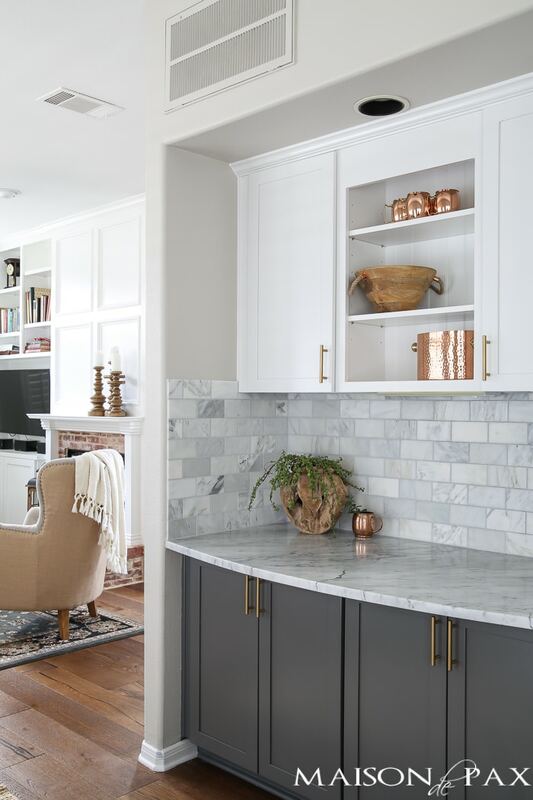 The bookcase was custom built, but we opted for a very simple front (to match the shaker cabinets we put in our kitchen at the same time). The molding around the fireplace is my favorite, though. 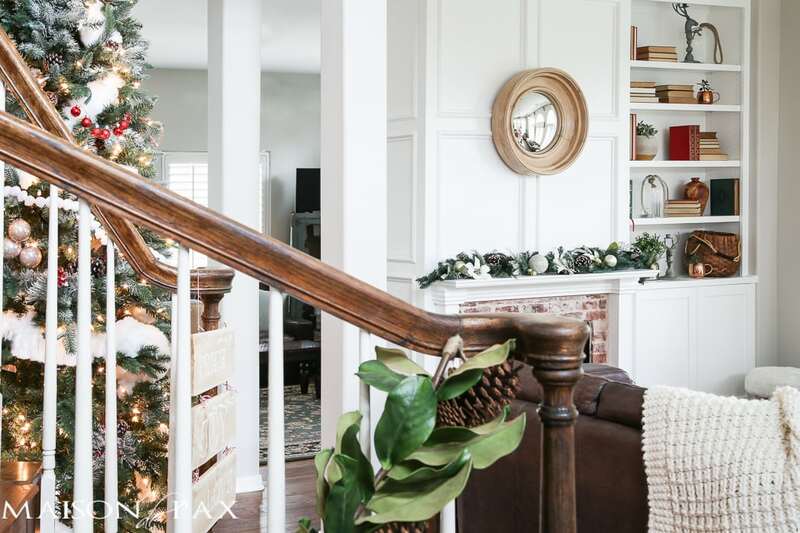 We used block paneling (which is similar to board and batten except the for the addition of an extra, more intricate trim piece to cover the seams) and had it all painted white to match the existing trim. The actual mantel was a loooooonnnnng process of finding designs I liked and then making them into the dimensions we needed and trying to decide if I still liked them at that point. 😉 The tricky thing is that I really wanted legs so that it looked like a traditional white mantel, but the distance between the brick and the bookcase was not very far. I love what we ended up with, though, which was simply a creative mix of moldings and some small-ish box legs. I was actually worried that the lack of symmetry might drive me crazy, but we love it. 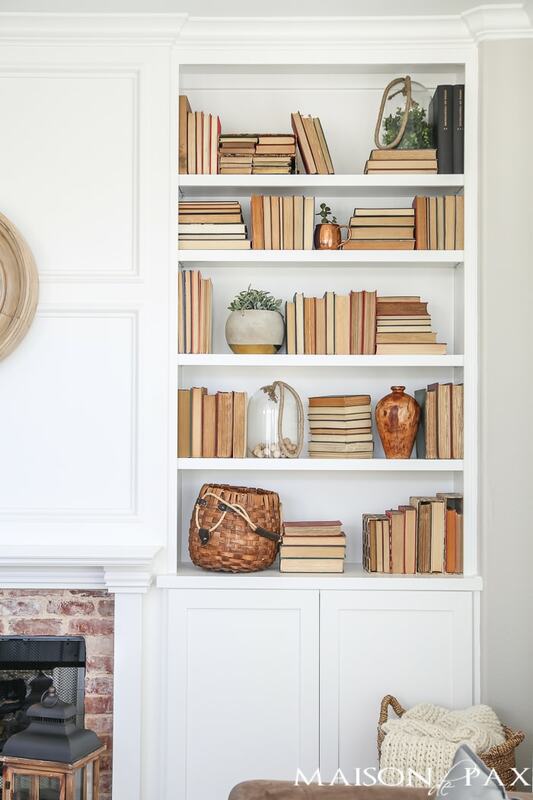 The bookcases are pretty (and functional… we needed somewhere for books and that tv! ), and the open side not only keeps the space from feeling closed off but also allows us to take in those gorgeous hill country views from both rooms. I must say, I love the transformation. There’s nothing quite like having a vision and seeing it carried out, amIright? Tell me, would you have done the same thing? I really like the look of book pages side facing out, but it’s very impractical when looking for a particular book. I think the idea of covering them in either plain paper, or coloured paper, and labeling them in a very neutral colour that blends in would be a bit more sensible. That’s my only thing, but LOVE the rest of the makeover!! Most beautiful renovation! Congratulations and enjoy! One question-regarding your Christmas stocking display. How did you make, or where did you purchase, the copper pipe holder that is hung between the snowflakes? I zoomed in, but couldn’t make out the detail. Very clever! Thank you. Thank you! I just threaded a wire through a piece of copper pipe and wrapped the wire several times around each of two stocking holder hooks. You can see more about it here. Hope this helps! I did remember what you had done but it was nice seeing the before and after,it looks so amazing now, or at least more to my liking. I know you are enjoying this home and all the space. WOW! This is a spectacular case of reimagining a space/feature that shouts it’s age (and perhaps a slight lack of initial imagination). And the functionality gained. Just amazing. What a beautiful design job! It looks like you improved the appearance as well as the function of those two rooms. And who couldn’t use more shelf space? I love it! Right? I love having the extra shelf space. Thanks, Martha! Beautiful look. Loving the bookshelf on one side which one doesn’t see often. I also love the way you’ve placed the books, so calming and graceful. Very impressive improvement. I could not ha e invisioned doing that! Looks beautiful! Like it because it is no huge, rather a great focal point! 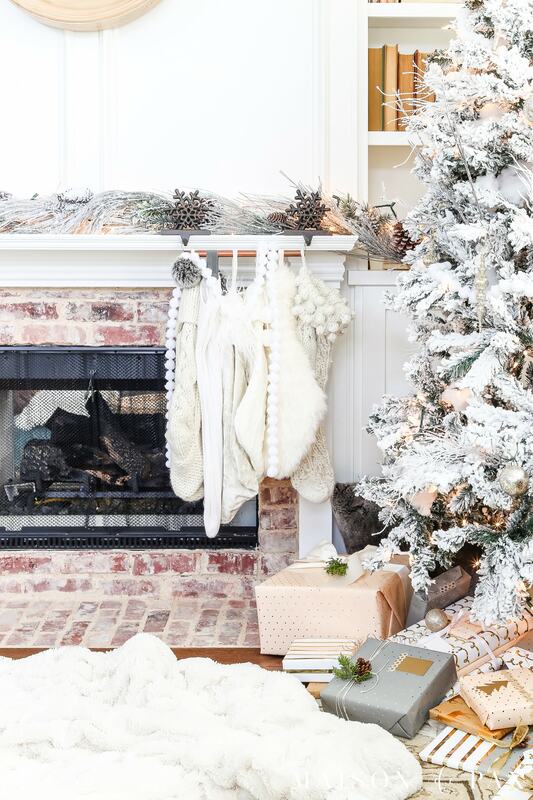 Love the fireplace! 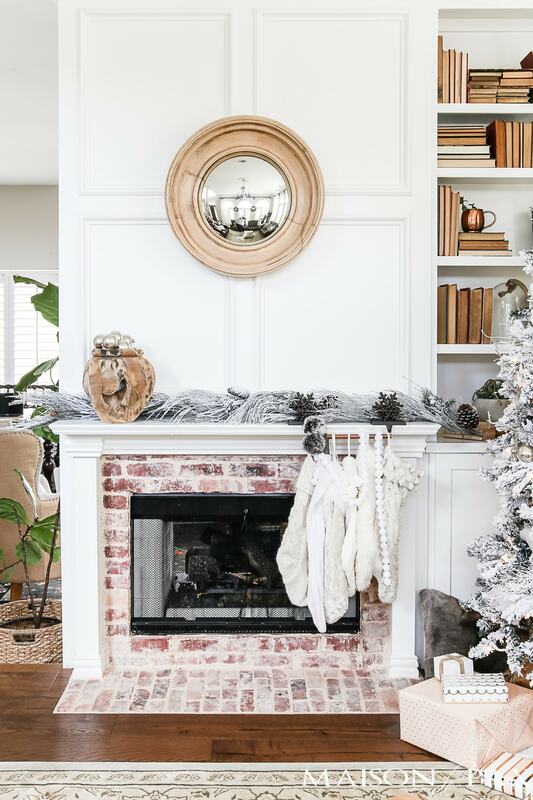 We have a brick fireplace that would look great with that mantle! Thanks Julie! I hope it inspired you. Wow! 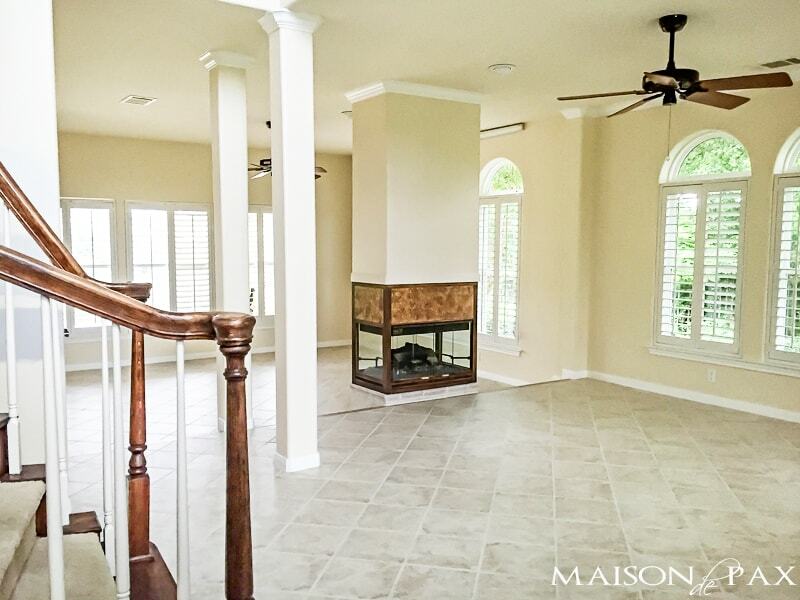 That really is a stunning fireplace, built-ins and moldings! I can see how much thought and planning went into all the changes and that it was so necessary for the overall look and more importantly, feel of the space. These are the details that separate designer’s from decorator’s. I saw the natural large beads on your mantle, I have looked everywhere for them with no results, can you tell me where to find them? 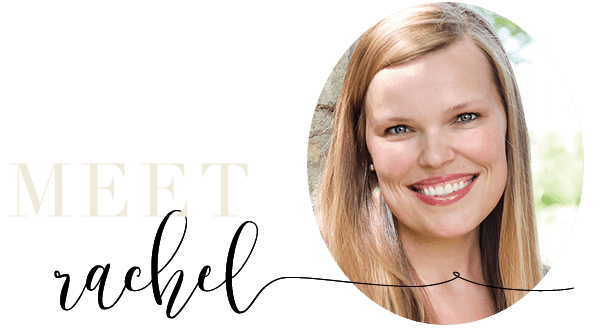 Love your blog, the progress on your home has been amazing! Oh Cathy, you are so sweet! Thank you so much. 🙂 . The wood beads are actually just from a package I found on the raw wood craft aisle at Hobby Lobby. I think I bought the 1″ beads and strung them onto some twine I had. I hope this helps! 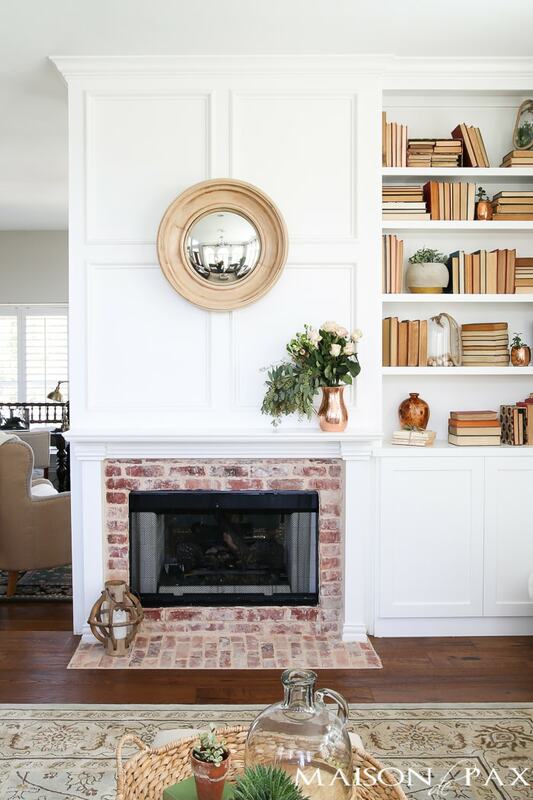 Rachel, I LOVE what you did with this fireplace!! The paneling over the fireplace is so beautiful and I love that it’s all double sides and you get to enjoy this from both rooms! Thank you, Lisa! It was a tricky space to style, but I love how it turned out.